Leading Exporter of lab water purification system, molelement water purifier, molgene water purifier and water purification system (ultrapure water system) from Chennai. Molatum system produces ultrapure water straight from your drinking water supply. 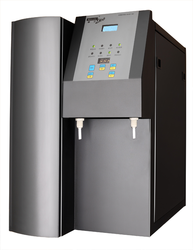 This equipment incorporates a pre-filtration unit and a reverse osmosis membrane in one single compact module. From tap to ultrapure water -- only one innovative step. Build-in 30 L water tank available external water tank, the users can extract either Type III water from the tank of Type I water from the dispenser depending on the system type. Upgrade function for the quality and quantity of outlet water. Easy to clean, disinfect and drain off the waste water. Digital display the time of regular intake or the water pressure. Sample pretreatment, e.g. : reagents preparation, laboratory washing and tissue cleaning. Conventionala physical and chemical analysis experiment, e.g. : Toxicity test, quantitative analysis of trace element, buffer solution. 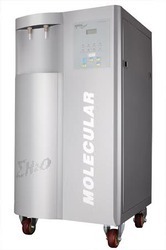 Tle Molelement System is a cost effective means of producing analytical grade water. Pretreatement, reverse osmosis module, deionization cartridge, storage tank, UV sterilizer are all integrated into one system. Various System options are available to fulfil your lab needs. Components of the system free of charge for one year warranty (comsumables except). 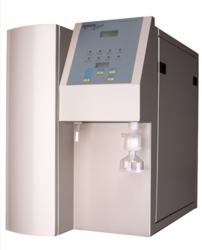 Molgene is our advanced configuration lab water purifier. DOW reverse osmosis membrane ensures stable running and high desalinization rate. Build-in ultra pure package and pretreatment package with RFID chip, 30 L water tank to save the space, the external water tank can be also supplied to meet requirement of the water flow. 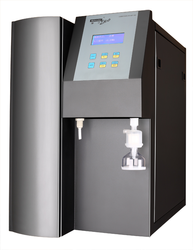 We are a trustyworthy organization offering a wide a gamut of Water Purification System (Ultrapure Water System).